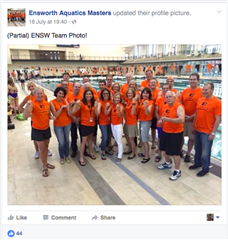 Ensworth Aquatics Masters (ENSW) is a registered club with U.S. Masters Swimming (USMS) and is made up of an incredibly diverse group of athletes. Ages of our swimmers currently stretch from 20 to 80 years old. Swimming Abilities of our teammates comprise a very wide range. The collective past experiences of our team members include swimming in the Olympics, college swimming, high school participation, summer-league swimming as kids, as well as merely wading in lakes or playing in baby pools in the past. Goals of our teammates range from aiming to score at USMS Nationals Swimming Championships, to participating in local swim meets, competing in Ironman triathlons, trying to complete a first-ever sprint triathlon, attempting open water swims, swimming for fitness only, learning all four strokes, and learning how to swim with proper technique and not sink. Our athletes are guided by experienced coaches who are passionate about swimming and driven by a desire to help athletes improve their fitness, speed, and confidence in the water. We are proud to be a cohesive group of team members, who share a wonderful camaraderie and provide a welcoming environment to visitors and anyone new to the team. We hope you will feel free to stop by and give us a try. Our swimmers are guided by experienced coaches who are passionate about swimming and driven by a desire to help athletes improve their fitness, speed, and confidence in the water. Head Coach Chris McPherson is certified as a ASCA (American Swim Coaches Association) and USMS Level 4 coach, and has 20+ years of varied coaching experience, including 17+ years of guiding masters’ swimmers. Coach Jack Hazen also has numerous years of coaching multiple levels of swimmers. Both coaches are keen technicians, but also promote a fun and enthusiastic atmosphere at practice. Is there a limit to the number of practices per week/month I can attend? You can swim as many times a week or month as you desire; we offer unlimited practices for $60/month. Do I need to be able to swim a certain number of laps to join? There is no ability level requirement to join Ensworth Aquatics Masters. We are happy to receive athletes of varying abilities, and the coaches are willing to work with each swimmer to reach his/her goals. Will I need to participate in competitions if I become part of the team? No competitions are required! We have a diverse group of athletes; some compete in races (swim meets, triathlons, open water, etc. ), but many just swim for fitness, technique, and fun. Please contact Head Coach Chris McPherson at mcphersonc@ensworth.com for additional information. Getting started is easy. Pick one of our 10 weekly practices that is a convenient time for you, and stop by to give us a try. Prospective members are welcome to participate in two free workouts before signing up for the team. Once registered with Ensworth Aquatic Masters, you will receive weekly newsletters with team information, including any practice changes for that week. * Become a member of USMS. Our team name will be found in the Southeastern LMSC with the abbreviation, ENSW. All Ensworth Aquatics Masters swimmers must be registered with USMS for liability reasons. * Register with Team Unify. * Bring $60 cash or check (made out to “Ensworth” with “Ensworth Masters” in the subject line) to pay for monthly dues.